Need a quick & easy dinner idea? Try these Pork Medallions with California Prunes and Walnuts! It’s super easy, only takes a few minutes to cook up, and tastes like it came from a five star restaurant! Make it tonight for dinner! 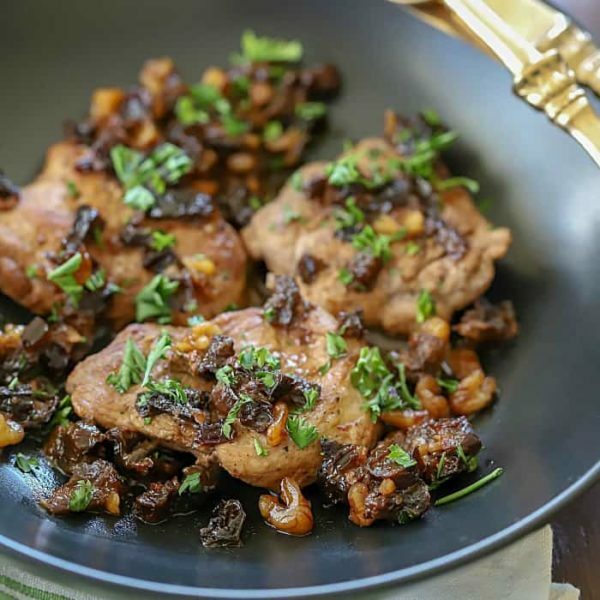 This Pork Medallions with Prunes and Walnuts Recipe will NOT disappoint! So many delicious flavors altogether in one dish! If you haven’t cooked with California Prunes, you need to stop what you’re doing and make this recipe ASAP! I know what you’re thinking, “why prunes?” or maybe you’re thinking “prunes are for old people” If you’re asking those questions, you need to keep reading this post! Let me tell you all the things you need to know about prunes. You probably already know that prunes are dried plums, right? There is a specific type of plum that’s grown just to make prunes. I was invited by the California Dried Plum Board to visit Napa, California a few weeks back (hopefully you saw all my prune Instagram Stories!) to visit the Culinary Institute of America (dream come true!) and to visit a farm for a prune orchard tour! It was so much fun! The first day in Napa, we got to visit the Culinary Institute of American, or CIA campus which is darling. We listened to a panel of prune growers talk about why they’re passionate about what they do. We watched some fun cooking demos from two chefs, and a nutritionist gave us all some very informative lessons about why prunes are a healthy snacking choice. They set up a fun pairing with a bunch of small samples of different foods and prunes, just to show us how prunes can be paired with many different types of ingredients. Next, we got to go to the Culinary Institute of America’s amazing kitchens on campus. You guys, dreams do come true!! I cooked alongside some of my blogging friends in this huge kitchen that was stocked with any kind of tool you could ever need and tons of produce and meats, etc. My group made a yummy dish of pasta, mushrooms and prunes. Check my dish below on the top right! I would have to say though, my favorite part of the trip was visiting Joseph Turkovich Farms to tour their Prune Orchard. The amount of time, resources and passion that these prune farmers put into their orchards is incredible. It was obvious that these farmers really care about the outcome of the plums. They aim to have the highest quality prunes and maximize each trees potential. Here’s a few fun facts: A prune plum tree produces up to 300 pounds of fruit. It takes THREE pounds of the fresh fruit to make ONE pound dried! A daily serving of prunes (4-5) can support good bone, heart and digestive health as well as immunity and healthy aging, with fewer than 100 calories, 3 grams of fiber, no cholesterol, no sodium and no fat. Oh, and let me set the record straight – prunes are NOT a laxative. We were spoiled with all sorts of delicious dishes inspired by prunes! 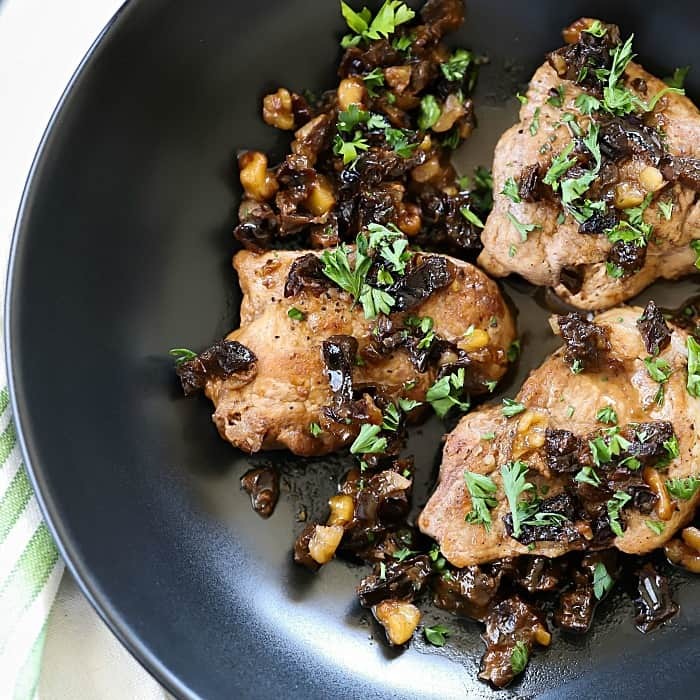 Now, it’s my turn to share with you an amazing dinner you need to make tonight, with prunes – Pork Medallions with Prunes and Walnuts! I’m obsessed with this recipe. I never knew prunes would pair so well with pork and walnuts. The pork medallions are cut from a pork tenderloin, which is an incredibly tender and lean cut of pork. 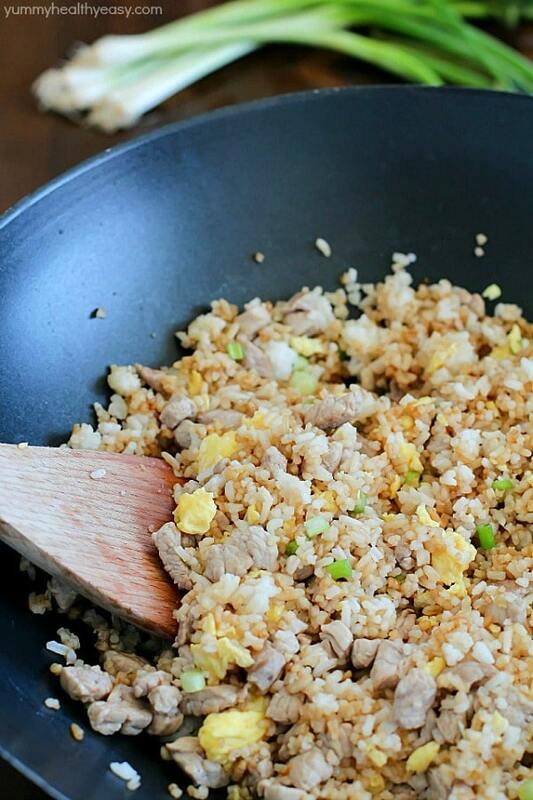 The pork cooks super quickly, making this meal done in under 30 minutes! The flavor combination of pork, walnuts, prunes and red wine vinegar is so delicious. I can’t wait to make it again and again! I hope I’ve opened your eyes to the vast ways prunes can be used and just how great these little dried plums can be for you! Go grab yourself a bag of California Dried Plums and make this Pork Medallions with Prunes and Walnuts Recipe tonight for dinner! These Pork Medallions with Prunes and Walnuts is super easy, only takes a few minutes to cook up, and tastes like it came from a five star restaurant! Make it tonight for dinner! Place pork pieces in a large plastic bag and pound out to ½ inch thick. Salt and pepper each piece. Heat 2 Tbsp. olive oil in nonstick skillet. Once hot, place pork pieces in and let brown, untouched for about 3 minutes. Flip pork and add in the last 2 Tbsp. olive oil and walnuts. Allow walnuts to toast. Deglaze pan by adding in broth and letting it cook down. Add the prunes and red wine vinegar and let heat through. Top with parsley and serve. Enjoy! The post Pork Medallions with Prunes and Walnuts appeared first on Yummy Healthy Easy.